My all-time favorite dish at my favorite Baltimore Italian restaurant is called “Drooling Gnocchi.” I actually haven’t ordered anything else off their menu. 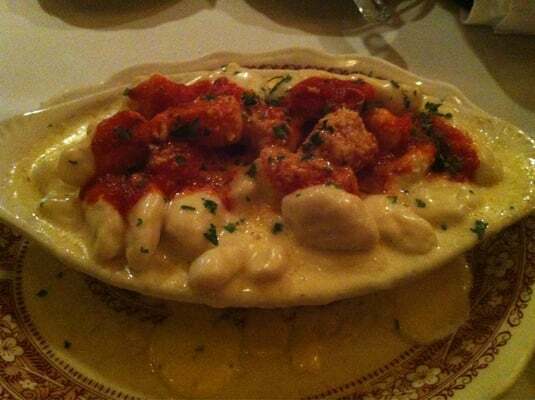 Every time we go, I swear that I’m going to try something new, and every time I order Drooling Gnocchi. It is dripping in butter and cheese with just a touch of marinara sauce to make you feel like there was some fruit/vegetable redemption in there. But there’s no fooling yourself into thinking this is health food. Not the slightest chance. Aside from the butter and cheese, what I love about this dish is the light and fluffy texture of the gnocchi. It’s such a nice change from al dente pasta that most Italian dishes are based on. Many moons ago, I got a red kuri squash in our CSA and had no clue what to do with it. 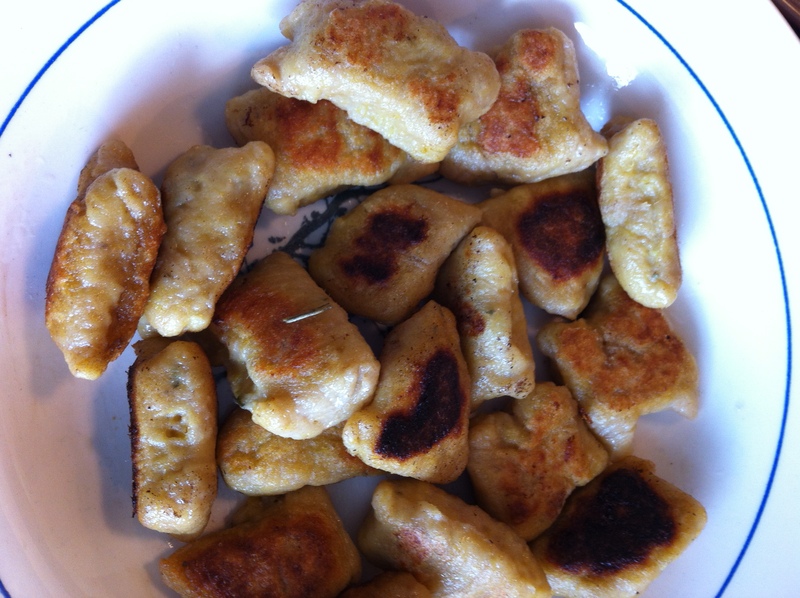 The first interesting recipe I came across was for gnocchi! 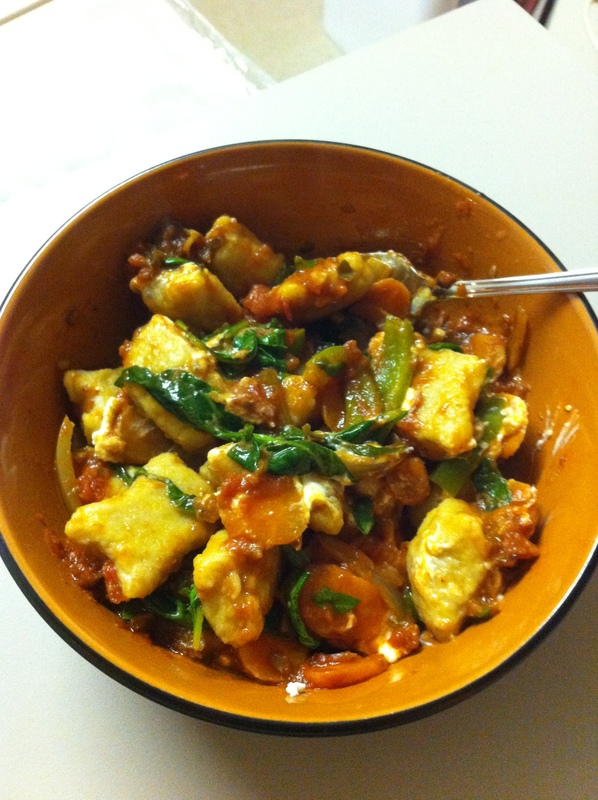 I had never thought about making my own gnocchi, but I figured, why not! It went well, and I might have eaten it all while the husband was traveling for work. Round two: let’s make the same recipe using the acorn squash from the Giant Squash Roast and some additional sweet potatoes thrown in (to make sure it made plenty of gnocchi)! I used the same recipe as a base and adjusted it for the new squash flavors. Fair warning: this is not a fast recipe. I did not time myself, but give yourself plenty of time or plan ahead and roast the squash in advance to speed up that part of the experience. 2. 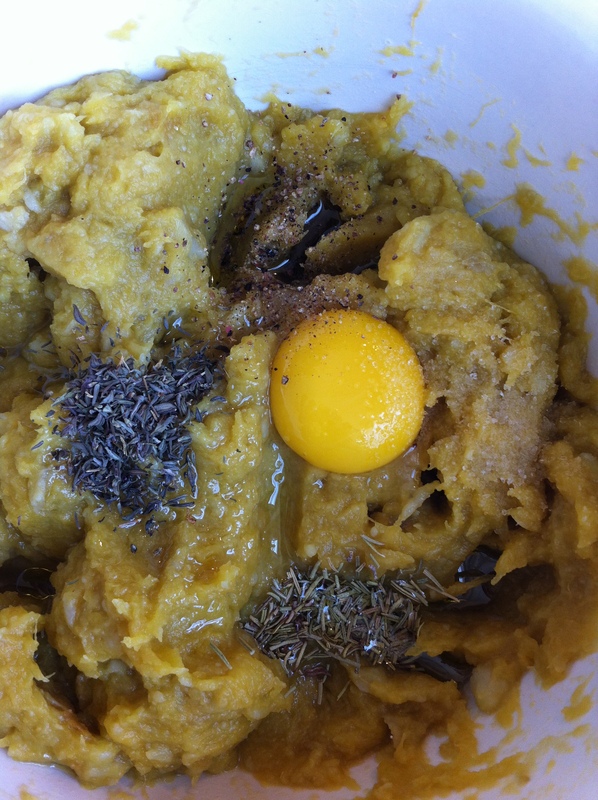 When the squash is finished roasting, scrape the flesh away from the skin using a spoon. Combine the acorn squash with the cooked sweet potato and mash with a potato masher or blend together with a food processor. 3. 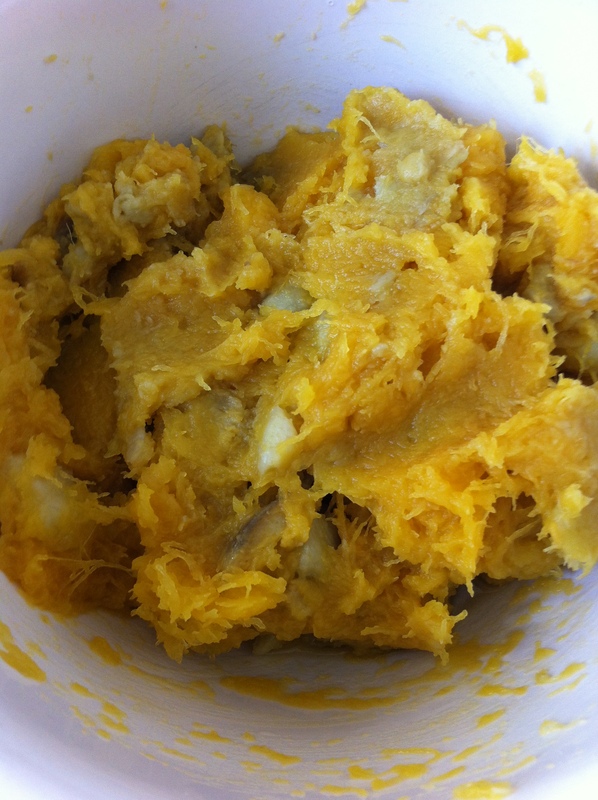 To the squash and sweet potato, add the 3 tablespoons olive oil, the egg yolks, herbs, and salt and pepper. 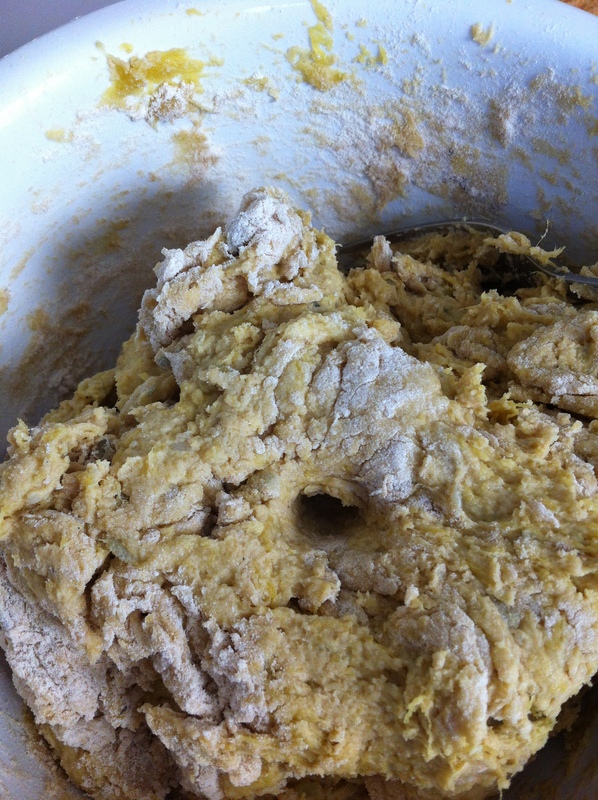 Add in the flour* and cut it into the squash to try to keep the dough soft and light. The goal is to end up with a dough that holds together but is soft enough to stick your finger in the dough and not be coated with squash meat when you pull it out. *Depending on the size of your squash, you may need more or less flour to achieve the soft dough. Use the finger test to know when you’ve got it right. 4. Let the dough rest for about 10 minutes. If you plan to cook some gnocchi right away, prepare a saucepan of salted water for boiling. 5. Cut a piece of dough about the size of half a tennis ball and roll it into a cylinder with plenty of flour. The dough is really soft, so you need gentle hands. (This is why I don’t start the water boiling yet so I don’t feel the pressured to get them done fast.) 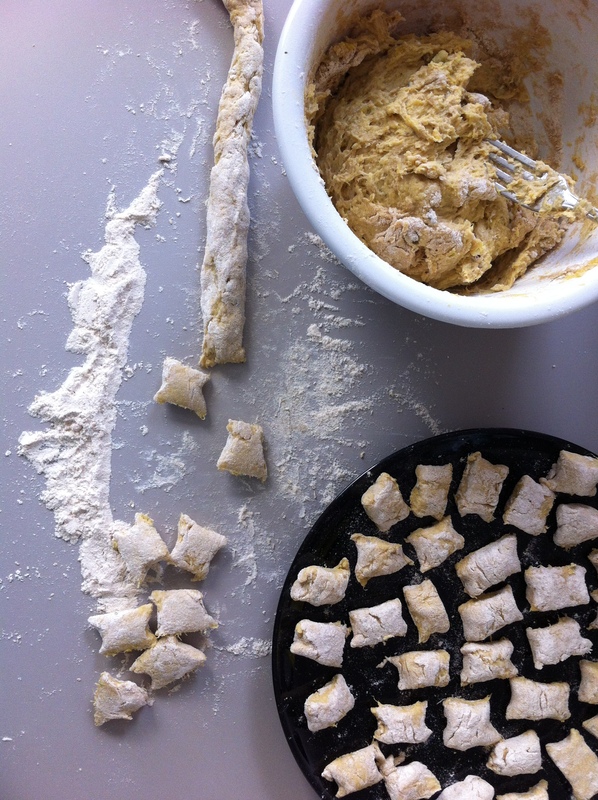 Cut the dough into half-inch pieces. Some people say you should make lines on the gnocchi, but by the time I’ve gotten this far, I’ll be damned if I’m willing to decorate each individual piece of gnocchi! 6. 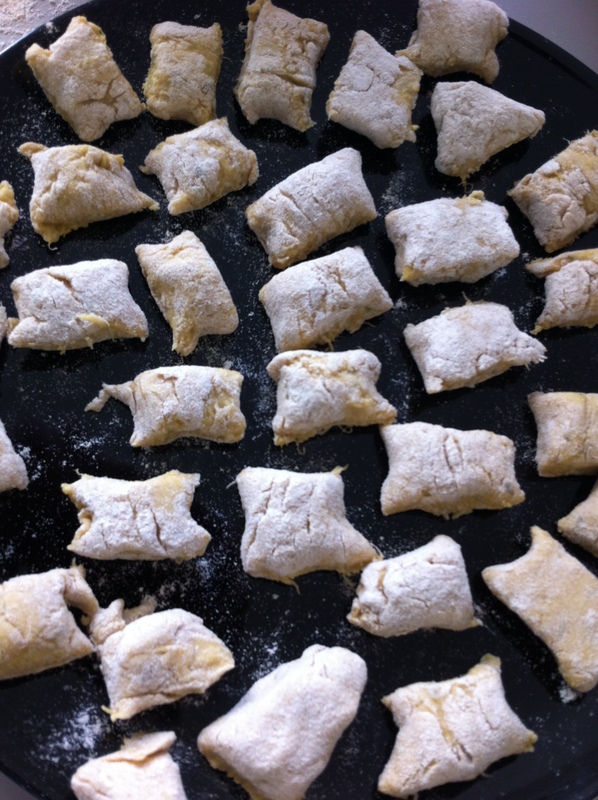 If you’ve made more gnocchi than you will use fresh, freeze the gnocchi on a parchment paper-covered plate or cookie sheet, spread out so they aren’t touching. As soon as they are frozen solid, move them to a freezer bag and see how long you can actually keep them in the freezer. 7. To cook them (fresh or from frozen), boil a large pot of salted water and add the gnocchi. Stir once gently to make sure they aren’t sticking to the bottom of the pan. When they are finished cooking, they will float to the top. Remove carefully with a slotted spoon. Serve with sauteed vegetables and a nice sauce, or to really up the ante, pan fry the gnocchi in some butter or good olive oil before serving with proper accouterments. 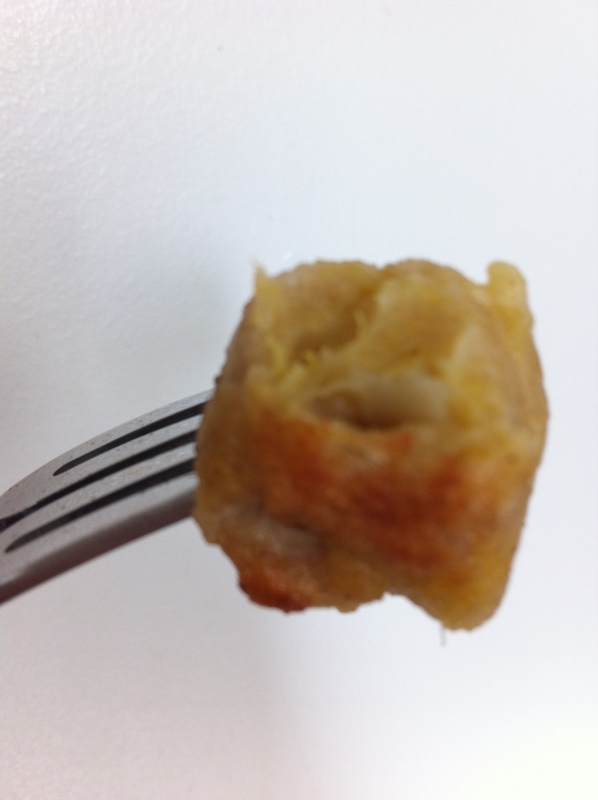 To see what else happens with the gnocchi, stay tuned…. Previous Post Previous post: A Bye Night for the Cook! Oh have mercy – The Husband will LOVE this one. Mr. 100% Italian loves to make Gnocchi and we do “love us some sweet potatoes”. I will have to feature this post in one of my upcoming Fall Food posts (and we still have to try the popcorn!! – October is almost over…). Glad you popped over to my post – it gave me a good excuse to momentarily stop working on the next one. How are you guys doing after the storm btw?? Sorry for not asking that first!! Thank you for asking about the storm! We weathered it pretty well. Some damage to a wall under a leaky window, but just cosmetic, I think. We never lost power, either, which was such a blessing! Were you in the path of Sandy? So glad you guys are ok – sorry about that damage you had though! We are in Central FL so we got hit with a lot of intense wind last weekend as it started up the coast but were very fortunate to only have damage to a screen panel over the pool. Also cosmetic so we are fortunate.